The incidence of type 2 diabetes is on the rise, which experts largely attribute to the rise in obesity. Type 2 diabetes, which is responsible for 90 to 95% of all diabetes cases, is more common in adults, but as rates of childhood obesity increase, more young children are being diagnosed with the disease. The good news is that simple lifestyle changes can prevent and, in some cases, counter the course of this disease. Following digestion, a hormone called insulin is released into the blood from the pancreas. Among insulin’s primary roles is its ability to allow carbohydrates (absorbed in the form of glucose) and proteins to enter muscle cells, where they are stored or used for energy. With type 2 diabetes, some insulin is produced, but the body does not effectively use it. This condition is known as “insulin resistance” and prohibits glucose from entering the cells. In turn, blood glucose rises to abnormal levels in the blood. If unchecked for extended periods, elevated glucose levels lead to heart disease, kidney failure, blindness and nerve dysfunction. Type 2 diabetes is strongly linked to lifestyle factors, especially diet and exercise. People at highest risk of developing type 2 diabetes have a family history, as well as other cardiovascular risk factors, such as high blood pressure, high cholesterol, obesity and a sedentary lifestyle. However, the same techniques that are used for prevention of this disease—a healthy diet and regular exercise—can be used to control and possibly reverse its progression. 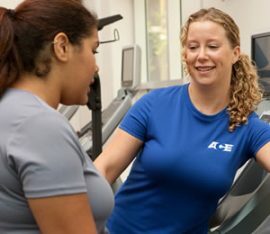 The latest research has put exercise at the forefront in the prevention, control and treatment of diabetes because it decreases insulin resistance. Following regular exercise training, cells can better respond to insulin and effectively take glucose out of the blood and into the cell. Exercise also helps to decrease the risk of cardiovascular disease by decreasing blood pressure, cholesterol levels and body fat. If you have type 2 diabetes, you must monitor your glucose before and after exercise to understand how you respond to certain types of activities. Also, exercising with a partner and wearing an ID bracelet indicating one’s diabetic condition are very important.